The Assam assembly elections are over. The two-phase elections -- on April 4 and April 11 -- registered an overall polling of 84.72 per cent, the highest ever for the state. Understandably, all political parties are interpreting this to their advantage. The first phase of the elections, covering 65 seats, saw a voter turnout of 78 per cent -- higher than that of the 2011 assembly elections, but slightly less than the 2014 Lok Sabha elections in these areas. 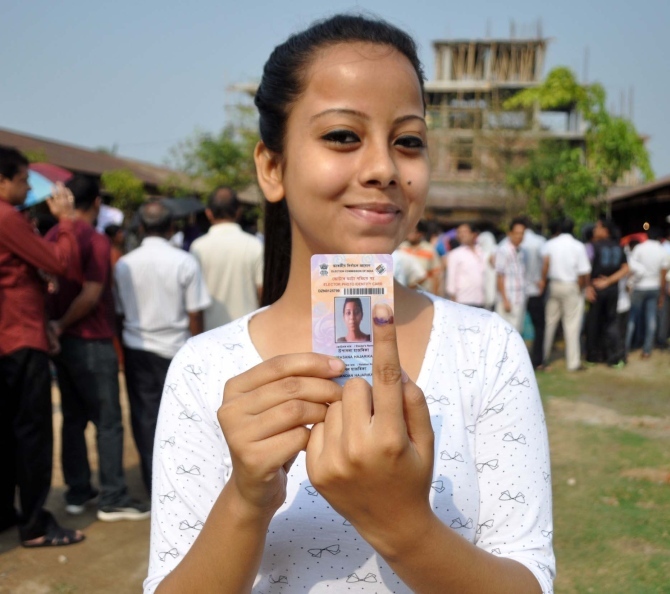 Chabua in Dibrugarh recorded the highest turnout -- 85 per cent. Chabua is the constituency that covers Jerai Chakalibhoriya, the village of top United Liberation Front of Asom (Ulfa) leaders Paresh Baruah and Anup Chetia. Voting was peaceful also in Margherita where the Ulfa's anti-talks faction had warned voters to shun Bharatiya Janata Party candidate Bhaskar Sarma. Obviously, people ignored the warnings and Chabua has become the benchmark in turnout terms. Psephologists and those who have studied Assam elections say the high turnout has the Congress worried. It is a fact that low turnout has always gone in favour of the Congress, especially during the days of insurgency in the state. Besides, around 65 per cent of Assam's voting population is below 40. The argument is that this section of the population is generally anti-incumbent and will vote for change. The only possible exception is Titabor, where Tarun Gogoi contested, which saw a 78 per cent turnout. However, this is attributed to Gogoi's personal popularity -- even his detractors concede that he is one of Assam's tallest leaders and people came out in large numbers only to endorse this fact. Majuli, the BJP's chief ministerial candidate Sarbananda Sonowal's constituency, saw an 80 per cent turnout, including those areas which are accessible only by boat. The current assembly member, Rajib Lochan Pegu of the Congress, is a little concerned. In most of these areas, an early morning surge of voters suggests that people, especially daily-wage earners, voted first before going out to work. An analysis of the turnout is revealing. The highest polling percentage of 93.53 per cent was recorded in Jaleswar assembly constituency in Goalpara district, while the lowest was 75.05 per cent at Silchar in Cachar district. The previous highest percentage was 79.21 per cent in the 1985 assembly polls held after the culmination of the six-year-long Assam agitation against migrants. In the 2011 assembly polls, the overall voting percentage was 75.9 per cent. In this election,the percentage of women who voted was 84.81 per cent -- slightly higher than that of men, which stood at 84.64 per cent. Of the total 126 assembly constituencies, in 68 -- 44 in the first phase and 24 in the second -- the polling percentage of women voters was higher than that of men. According to local Election Commission data, 16,900,487 voters exercised their franchise, of which 10,310,623 were male and 9,637,067 female. Kamrup Metropolitan district, which has four assembly constituencies -- Gauhati East, Gauhati West, Dispur and Jalukbari -- also recorded its highest-ever polling percentage this time: 80.17 per cent. While the BJP and its alliance partners, including the Asom Gana Parishad, are exulting publicly over the high turnout, privately they are a bit worried, especially about the second phase, which saw large numbers of people voting in Muslim majority areas. They have worked out that the queues of voters in Muslim majority areas were not of BJP voters. For instance, out of the 10 assembly segments of the Lok Sabha constituency of Dhubri, represented by All India United Democratic Front leader and member of Parliament Badruddin Ajmal, eight saw over 90 per cent voting, while the other two came close. In his brother Sirajuddin Ajmal's constituency of Barpeta, which has seven segments, the turnouts ranged from a low of 87.72 per cent to a high of 90.91. Outside the AIUDF's two Lok Sabha constituencies too, assembly seats in various districts had very high turnouts: Boko (89.09 per cent), Chhaygaon (90.58), Barkhetri (88.78), Dalgaon (91.42), Mangaldoi (88.61), Laharighat (87.18), Dhing (92.01), Rupohihat (90.05), Batadroba (87.04) and Samaguri (88.67). Muslims have drifted towards the AIUDF since Ajmal floated it against the backdrop of the Supreme Court scrapping the Illegal Migrants (Determination by Tribunal) Act after describing Bangladeshi influx as a 'silent external aggression' of Assam. Muslims, who comprise 34 per cent of the population, used to vote largely for the Congress, except in 1985 when many went for the United Minorities Front of Assam, formed after Rajiv Gandhi signed the Assam Accord with the All Assam Students Union. However, the turnout could work in favour of the BJP. The Congress and the AIUDF struggled to reach an alliance ahead of the elections, but failed to come to an understanding. The BJP reckons the Muslim vote will split and the advantage will accrue to the saffron alliance. With Ajmal seeing himself as a kingmaker in the event of a hung assembly -- he has already said there is no question of going with the BJP; and he could consider an alliance with the Congress, if approached -- all eyes are on May 19 when the votes will be counted.